Blame the cloud cover, but Seattle is sadly lacking in rooftop bars. With killer views and a long happy hour (every day from 4 to 10 p.m.), Frolik Kitchen + Cocktails on the fifth floor of the Red Lion Hotel fills that void--and then some. There’s shuffleboard and table tennis, a patio fireplace, plus a cocktail list that embraces local, seasonal ingredients--try the Seattle Sazerac, made with Oola Whiskey from Capitol Hill--and creative bar snacks, like bourbon-bacon popcorn and crab mac ‘n’ cheese. Best of all, because it’s elevated, you’re out of the downtown rush but still in the thick of it, with glimpses of Puget Sound to boot. 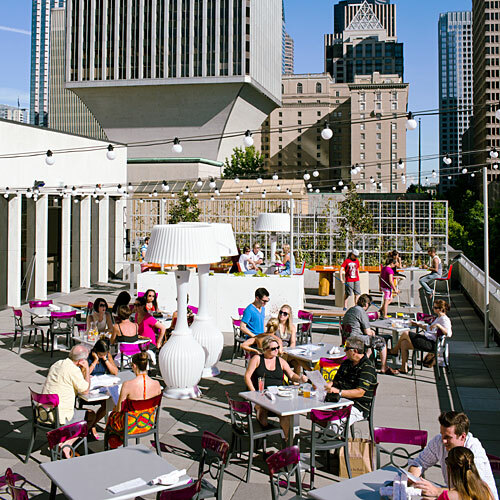 Blame the cloud cover, but Seattle is sadly lacking in rooftop bars. With killer views and a long happy hour (every day from 4 to 10 p.m.), Frolik Kitchen + Cocktails on the fifth floor of the Red Lion Hotel fills that void–and then some. There’s shuffleboard and table tennis, a patio fireplace, plus a cocktail list that embraces local, seasonal ingredients–try the Seattle Sazerac, made with Oola Whiskey from Capitol Hill–and creative bar snacks, like bourbon-bacon popcorn and crab mac ‘n’ cheese. Best of all, because it’s elevated, you’re out of the downtown rush but still in the thick of it, with glimpses of Puget Sound to boot.